So you have decided to take up the sport, maybe to get fit or stay fit or you have dug out your old Badminton racket. Either way you want to play so it’s time to hone those skills needed for a game. How good are your Badminton skills and techniques? In this beginners tutorial/guide we will look at all the basics the beginner requires to get playing and enjoying this great sport. So what are the fundamental skills of you need? Badminton requires you to be able to move around the court quickly so agility is key, but don’t worry if you are not the most agile because playing regularly will help you to improve in this area. 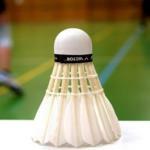 In fact Badminton along with other sports such as Squash and Tennis are ideal sports to improve not only agility but your hand–eye coordination whilst improving fitness. What more do you want from a sport/game? Enjoyment? Well Badminton in my opinion scores very highly on the enjoyment scale, because unlike Tennis (Which I Like) is way more accessible and easier to pick up and enjoy right from your first game or lesson. As I mentioned this is a sport that requires a lot of agility so this is the first thing to address. So moving around the court sounds easy but moving correctly means not only will you be able to reach and make more shots but you will also be less likely to injury yourself, a win win situation. So how do you improve your footwork? Well you will need to pratice these footwork drills which you can see in my article on Footwork. Don’t worry there are videos from the web to demonstrate how you should be moving and how having the right footwork will allow you to better anticipate your opponents next shot / move. Get your footwork right and your enjoyment playing the game will dramatically improve along with your skills and all-round competitiveness. Sounds very simple you just hold it and swing right? Wrong some people hold the racket too tightly which not only reduces your dexterity which will definitely impact you game, but it can sometimes cause the skin to blister. So if you want to improve your Badminton skills and techniques you will need to grip your racket correctly. I have other articles in which I go into more detail along with videos that show you exactly how you should hold your racket. Whether it’s your backhand grip or your forehand grip you are going to need to know the correct Badminton grip technique. And don’t worry I have an article on how to master these shots, it will show you how to improve your Badminton skills and techniques. Mastering these basic skills and techniques will increase your enjoyment whilst improving your competitiveness. As I said earlier and at the same time your fitness will improve. From there who knows you might be another Lin Dan or Saina Nehwal!!! I will keep adding more tips for beginners to help you improve your game and skill level. Need some inspiration? Check these guys out! Lets take a look at a couple of the current top and famous players. First up is the current mens number 1 Lin Dan (China) showing off his many talents and skills. I think you will agree these two players show just what a great sport this is. You don’t have to be as good as these players to enjoy a game down at your local club, school or even in the back garden. Is it not time for you to improve your Badminton skills and techniques? So why not get fit and enjoy sport by taking up the sport? Improve your skills and your waistline. I’ll also put together an advanced techniques article for those of you who already know the basics and are looking to take it to the next level. And remember Play sports, enjoy sports! Don’t forget to check out the rest of the site which is currently being expanded to cover even more aspects of our great sport.